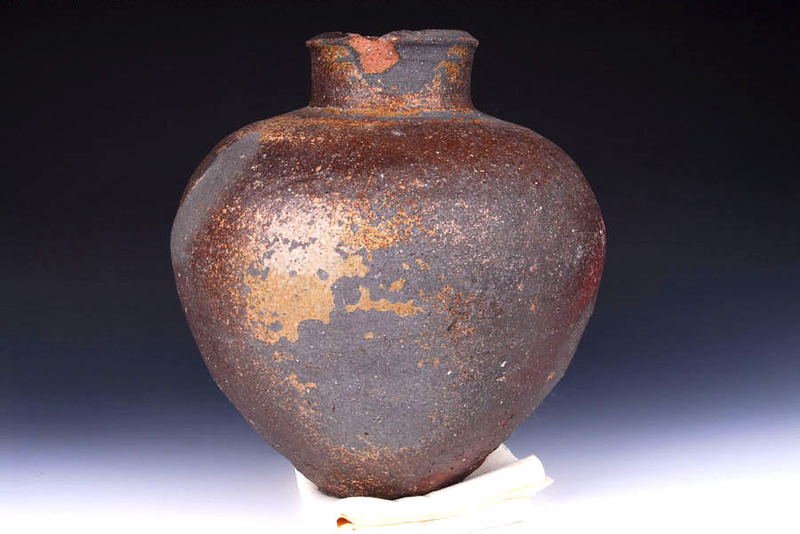 This is the second large Tokoname tsubo (large jar) we have for sale, also from the Momoyama to early Edo era. Tokoname is located in the central part of Aichi Prefecture and is the oldest of Japan’s six ancient kilns. Tokoname ware was first produced for religious purposes, especially in the form of vessels to hold Buddhist sutras. This Tokoname tsubo has a heavy, coarse body and is covered in several places with a natural greenish-yellow wood ash glaze. It has the classic shape of a sutra vessel, with bulbous, massive shoulders narrowing to a slender base. The base looks to be made on sand, typical of Tokoname ware. The lip has several chips, which reveal the clay to be reddish. Despite these flaws, it is a wonderful piece with rustic texture and stunning, masculine form. It can be used for display or for large ikebana arrangements. When using it for flowers, please insert a smaller vase to protect the tsubo and keep water use low. Condition: Good. Wear consistent with age. Shipping: Within the continental U.S.A. only. Please email info@mizuya.com for an estimate.